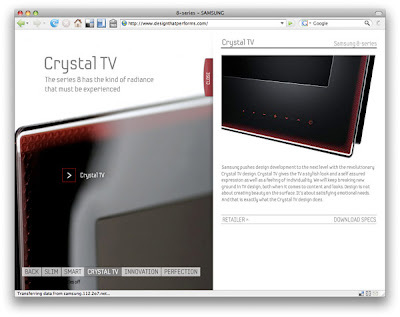 Much like the Computer industry, there isn't much online for Television sets that you would call advertising. But I did manage to gather a few sites. I will be honest though, this topic was inspired by a rather new site that hit thefwa today. We'll get to that one later. This first site I also found via thefwa, but not before searching throughout the official Samsung site for a link to it. It's for the Samsung 8 series, and the official site only goes up to 7. So I'm going to guess that they don't link to it from their official site because it's not for sale yet? They don't want to confuse shoppers? The site went up in January, so maybe the campaign is pending. 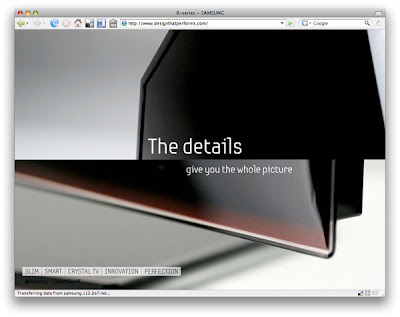 The concept for the site is becoming increasingly common, full-screen video presentation. A simple navigation that is basically a scene-selector. The videos end with a few hot-spots that open up a bit of copy. The video compression that is key to the execution of these sites is well done here. Although there is a bit of wait time, which isn't helped by the lack of a percentage or countdown type mechanism. Nothing too exciting here for a monday. Simple technique that makes sense for the product.